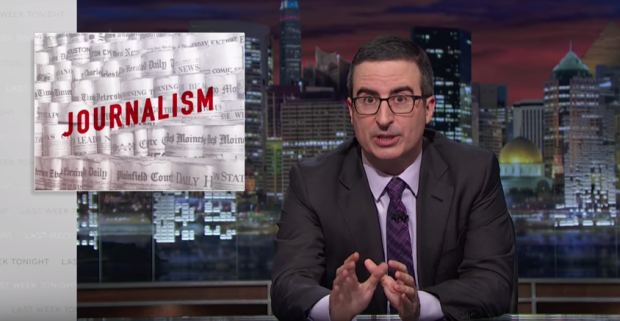 John Oliver: Journalism is in danger. When I watched John Oliver's 19-minute rant on the doom and gloom facing the newspaper industry, I didn’t know whether to laugh or cry. The TV host joined the dots to outline the way cash-strapped news organisations could inevitably lead to dumbed-down journalism. I have always strongly felt that democracy without journalism is akin to a three-legged chair. The day news outlets cannot afford to employ investigative journalists will be the day corrupt and inept public officials sleep a good deal sounder at night. Anyone who has worked in the newspaper industry has seen brighter days. The business models that have supported the profession for decades are under tremendous pressure. The increase in digital revenue does not make up for the decline in print advertising. As media outlets struggle to keep up with digital disruptions, newsrooms have been decimated, and we have seen 'news' often morphing into infotainment to try to cater for audiences with the attention span of a fly. According to The Financial Times, around 85c of every new dollar spent on digital in the US this year is going straight to giants Google and Facebook. A recent study by the Reuters Institute for the Study of Journalism says social media is rapidly becoming the main way people access information. Or should I say misinformation. An estimated half of those who consume news via social media do not check the source of the story. Now you wonder why your friends are still sharing those idiotic stories claiming that Cher is [once again] dead or that ISIS flags are being flown over Michigan. Facebook is not particularly interested in content or journalism but in user behaviour, clicks and ultimately advertising. This means the frivolous story about a man running naked on the Sliema front or the clip of the cute kitten being rescued from the Rottweiler will get more attention than the latest political scandal. A quick scroll on your Facebook news feed might give you an idea of what the world will look like without a probing media. In reality, few news agencies have found the right formula to thrive. While John Oliver may be right in exhorting his viewers to become paying local news(paper) readers, the challenges are different for every country and news outlet, especially in an age where we've grown accustomed to get our news for free. Giants like The Financial Times and The Times have somewhat succeeded in convincing readers to pay for content. Other once reputable news outlets have descended towards a slippery slope into tabloid gossip, and are smitten with click bait over substance. Imagine this: a magazine called Slant pays writers $100 per month, plus $5 for every 500 clicks on their stories. Like most brands, Times of Malta has seen a decline in its newspaper revenue but a rise in digital revenue… and more readers than ever before. In the first seven months this year, our website desktop traffic has increased by 21 per cent while mobile views shot up by a whopping 35 per cent. I refuse to measure success merely by clicks but by the number of news stories written and probed by our journalists on the ground, who work around the clock, and go out way out of their comfort zone. Critics say social media has practically swallowed journalism but in reality new forms of journalism have opened new doors for journalistic craft. I believe a short video clip, infographics and more concise writing can often tell a story just as effectively as a 2,000-word analysis. I believe newspapers and digital can live happily ever after, and yes, I subscribe to the fact that a news website should also provide light stories, provided we do not mistake 'popularity' for 'importance'. Journalism that scrutinises power and politics and business and holds power to account is. If you believe in the importance of a media which investigates and reports fairly – then readers and advertisers should do their bit to support news houses, in whatever shape or form. We will all suffer if the private sector and the private individual gives up on public interest journalism. It would be a sad day when a journalist’s traditional role of watchdog is relegated to that of a lapdog.